This is a great project for first time DIY’ers. It’s a simple, fun, and fast way to take a pretty boring piece and show it off in 5 great ways. 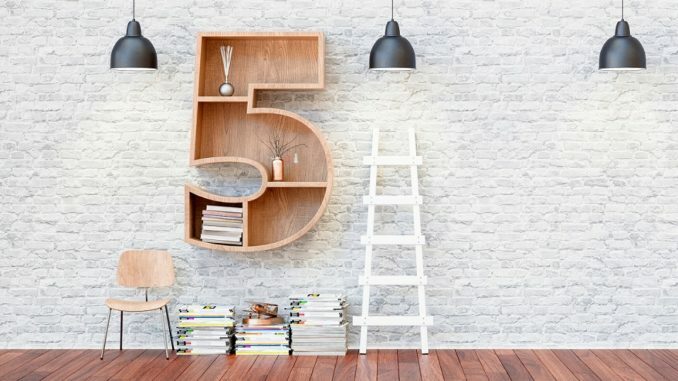 For our project, we decided to use a piece that most folks have in their home already, probably either purchased at a large retail store or inherited when you moved into your first apartment – the ladder bookshelf. Here’s the one we purchased from Walmart for around $68. It’s pretty standard fare, all black with metal frame and wood shelves. Sturdy but simple in design like most we’ve seen. Next we had to decide on what type of paint to use. We decided on spray paint for two reasons – first, spray works great on mixed materials (in this case wood and metal) and second, if you’re new to painting it gives you much greater control around angles and small areas than a brush (bonus – no worrying about brush strokes either!). With one exception, we used only Valspar Heavy-Duty Performance High Gloss Enamel. We liked that it needed no primer, is weather and scratch resistant and non-toxic. Our one exception was when we tested the grays and felt the high-gloss looked a little too utilitarian…but we’ll get into more detail on that further in the article. Now before we get into the projects, a little word on pre-prep. While the labels for all these paints stated no primer needed, you want to give your paint its best chance to adhere to the base material. We highly recommend a light sanding. However, if you’re not familiar with sanding paper, here’s a quick crash course – the lower the Grit number, the coarser your paper will be. Too coarse a Grit and too aggressive sanding can actually cause scratching into your surface. For that reason, we used a 220 Grit (aka Fine) sanding sponge to lightly rough up the surface. You can get one for less than five bucks at Home Depot. One block should work for the whole project. Also, while you could do this project with one can, we recommend getting two, just in case you have a few thin spots, and at less than six dollars a can, the price point is nominal for your piece of mind. If you have a small patio and are looking to bring a little green into it for interest, this is a great way to do it. As we mentioned, we decided on a Heavy-duty high gloss enamel. What’s great about this paint is that is makes the surface area perfect for either indoor or outdoor uses. The Oliver Green went on smoothly and once done, the upper shelves were perfect for adding small potted plants, while the lower shelves keep planting supplies right there at hand. Sometimes you have a small nook or area that could use a little pop. Our idea was to keep the original black on the metal portion of the ladder shelf, but add a vibrant color on the wood shelves. A quick note, since you’re leaving the black metal portion alone, you only need to light sand the wood shelves before painting. For our project, we used a vibrant orangey-red from Valspar called Kubota Orange. However you could use any color you prefer, maybe something matching to colors you already have in the room, or have fun introducing a new color into the space which you can then add to your overall décor. Okay so remember we said we used Valspar for all of the projects except one? We had a great idea to use the shelf ladder as open storage in a bathroom. The problem was, when we applied the typical gray paints, everything sort of took on a very utilitarian inexpensive office furniture and/or high school desk appearance, which was definitely not what we were going for. Enter Krylon with its fantastic Chalky Finish spray paint. There were a few we tested but the Misty Gray, once applied, looked amazing. It has just a hint of texture that creates a fab faux washed out light gray, very a-la Nantucket style. This was just perfect for lending much needed storage space to our beachy-nautical bathroom space. The nice thing about these shelf ladder units is they are made to be sturdy, which makes them a great choice for a kid’s playroom. That base black color, though…um, not exactly channeling playtime. Easy fix? Bright blue in the form of Valspar Ford Blue spray. The minute we put it on, the whole shelf took on a fun, kid-friendly vibe. Oh, and because this paint is meant for indoor and outdoor use, those sticky finger marks come off in a quick wipe of soap and water. Ask most interior designers and they will tell you that yellow is one of the most popular colors for kitchens. And why not? It’s cheery and welcoming from that first cup of morning joe to sneaking that late night snack before bed. With that theme in mind we tested and settled on Valspar Jd Yellow which just made us happy looking at it. Since the phrase “I don’t need any more storage space in my kitchen” was said by no-one-ever, this little shelf makes the perfect addition for quick grab items you use often as well as a great place to display some pretty accessories without taking up valuable counter space. Plus because this paint is made to withstand outdoors as well as indoors, it’s perfectly fine getting the occasional splash of liquid and multi-sticky fingerprints will clean up quickly with a swipe.